Many clubs are already seeing the benefit of using Quicksticks within their junior set up. The Quicksticks Challenge Cards have a variety of fun challenges which coaches can easily use within their junior sessions. The Curriculum Resource lesson plans can also be used as session plans and can be adapted to suit the age and ability of young players in your junior club. The Quicksticks online training course is suitable for new and less experienced coaches as well as young leaders. A series of videos take you through the steps of planning and delivering Quicksticks in various settings. Coaches can complete the course at their own pace to fit in with individual schedules and commitments. Insurance and Responsibilities - Whether you are delivering Quicksticks activity at your club or a local school please read our advice on who is responsible for the supervision and insurance of that activity HERE. How could Quicksticks benefit your club? Quicksticks is enjoyable to play for players of both genders and all hockey abilities. No goalkeepers are required and it offers all players full involvement and increased playing time. Quicksticks is highly adaptable. Quicksticks is aligned with the England Hockey’s Single System, Competition Framework and Club School Links policies. 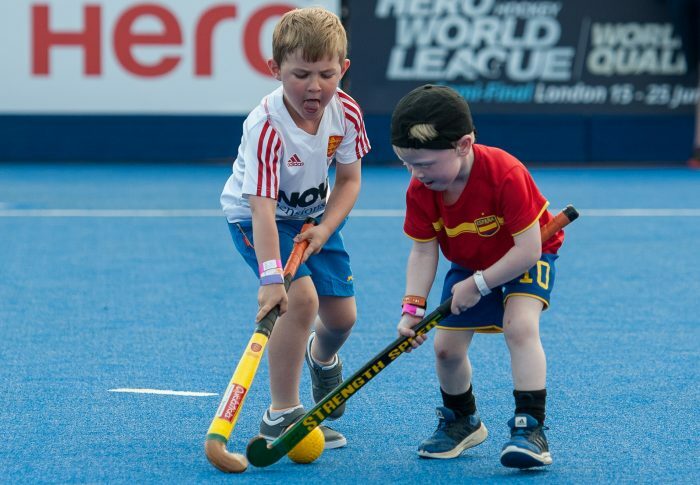 It is an exellent introduction to hockey and makes the transition to In2Hockey and 11-a-side hockey measurably easier and offers continutity from what is played in primary schools. Quicksticks offers young leaders opportunities to gain experience by delivering challenges to younger junior members. The game also includes manager and umpire roles to develop skills.